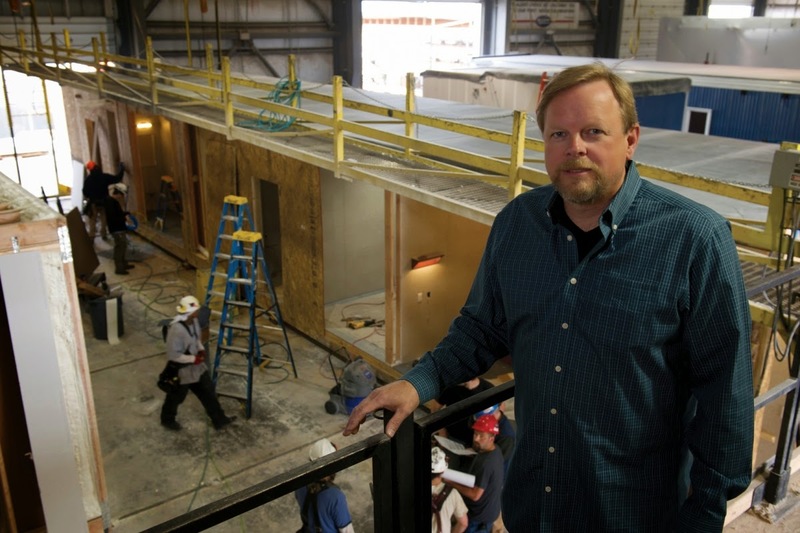 You may not think of Builders Choice Inc. as an oil services company, but it is, and the Anchorage-based modular housing construction company has a big stake in the future prosperity of the state’s petroleum industry. It’s for that reason the company has a large red-and-white “Vote No on 1” sign at the entrance to its plant on 104th Street in South Anchorage, said Mark Larson, who owns Builders Choice, or BCI, with his wife, Sandi. Builders Choice owner Mark Larson is seen at the company fabrication shop in South Anchorage. Larson said about two-thirds of his company’s $60 million in annual revenue is linked to the oil and gas industry. Two-thirds of BCI’s revenues come from projects directly related to the oil and gas industry, Larson said. The company hopes to diversify this year with a new business in lumber and building-related hardware, but for now, $40 million of BCI’s annual earnings of about $60 million are linked to the industry, Larson said. “Passage of Senate Bill 21, the oil tax reform bill, has created an enthusiasm in the industry to keep working here, and when new projects are developed the industry’s workers need housing,” he said. BCI operates a 50,000-square foot modular housing construction facility in south Anchorage that builds housing units mainly for industrial and commercial customers, along with a truss plant in the Matanuska-Susitna Borough that serves homebuilders. The Larsons have steadily built their business since taking over the company in 2001. Revenues have multiplied six-fold since then and much of that was due to the Larsons refocusing the company away from building modular units for residential construction and toward commercial and industrial clients such as the oil and gas industry. Today, the company’s roster of customers reads like a “who’s who” list in the natural resource industries, but new hotels and other large buildings, particularly in remote areas, have been important for BCI. The new Barrow hotel built for Arctic Slope Regional Corp., which opened last spring, is one recent commercial project. The building, which replaced an older ASRC-owned hotel that was damaged by fire, was built in a joint-venture with SKW Eskimos, Inc.
A new commercial store for Hooper Bay along with teacher housing was built when a large fire destroyed existing housing in that Bering Sea community, and BCI also built units for a new school at Kalskag, a village in the Yukon-Kuskokwim region near Bethel. Most recently, the company built the modular operations and housing facility for the Point Thomson project east of Prudhoe Bay, and previously built operations facilities for the Eni Oil and Gas Nikaitchuq field as well as facilities for BP and two large Deadhorse facilities built to house service company workers, the 426-bed Aurora Hotel and 190-bed Brooks Camp. BCI also built the camps and operations centers for the Greens Creek and Kensington mines near Juneau, which are both producing. Other previous commercial customers have included Alyeska Resort near Girdwood, for an employee housing facility, and modular units that were used to construct the Denali Canyon Lodge, built for Westmark Hotels. BCI builds its housing units in a controlled environment in its Anchorage plant which ensures better quality control compared with the traditional approach of “stick-built” structures where workers and materials are more exposed to weather and temperature variations, Larson said. The units are “stackable,” meaning that two- and three-story complexes are quite feasible. The modules are trucked to the North Slope 80 percent to 90 percent complete including the inside electrical, plumbing and even furnishings. The structures can be built, moved to the North Slope and put in use quickly. “With the Brooks Camp phase one (at Deadhorse), we began fabricating in Anchorage in August and had the units moved to the Slope and occupied in December,” Larson said. The schedule was possible because site work at Deadhorse was being done while the modules were being built in Anchorage. That allowed the units to be hooked up quickly when they were moved to the Slope. Larson feels confident he can compete with Lower 48 and Canadian module fabricators because the costs of moving completed units, which are bulky, outweigh the lower costs of building outside Alaska. He knows this because BCI also operates a small modular construction plant in South Dakota that is serving the booming shale oil industry in North Dakota. Labor and other costs are 25 percent lower in South Dakota than Anchorage but the location advantage is more important. There have been times when the company’s Alaska plants were at maximum use and some units had to be built in South Dakota and moved north but that did raise costs, Larson said.